On December 1944, Underground Headquarters was completed by 3000 Japanese soldiers. It was hidden built, so civilian couldn't get close to the area. This underground Headquarters has 450m long with at least 8 rooms include a room for commanding officer. This picture below the room was used for operational planning . The man who sit on a chair is Minoru Ohta Vice Admiral. The picture below is commanding officer's room. the picture below is Sally Forth Scene. Most of the naval personnel left the cave at this exit to make the final stand against American soldiers even though they were not properly armed to fight. Petty Officer's room. When the battle was getting intensified 4000 soldiers were staying. There-fore, soldiers had to sleep with standing. .
Medical Treatment room. Survivors of the battle remember seeing numerous casualties in this area, so it is likely that this was the tunnel medical facility. Passages Passages are used for resting. I want to dive into the water, but it's about 30 meters high... Don't make wrong choice... This is at Yomitan Village, cape Zanpa. Another view of cape Zanpa. Farmers are working at their farms. These farms are surrounded by Kadena air base & Oil storage U.S. army base. Kadena Air Base has been leaking several different kinds of pollutant in to soil & river. Don't you think foods are also contaminated ? I know many people evacuated from Fukushima area. However, I founded out that Okinawa is so contaminated by U.S. military presence. This farm is completely inside of the U.S. base. Farmers has a permission ID to go into a gate. The land is owned by farmers but Japanese government forcibly rent the land from farmers and give to U.S. military for free. These farms can be taken away whenever U.S. military needs to use the land. Concrete roof top is a Okinawan tomb. Over 71 years family members cannot visit any time. Today is 709th day, It's been almost 2 years since we started to sit in at Camp Schwab. Yellow Line, Since Okinawan woman was killed by U.S. military worker, we've been stopping all Y number vehicles(Military workers) and military vehicles. 24 hours on the road of Okinawa, you can see military vehicles, and often they make accidents. Many elders are retired school teachers. Many of them come everyday. 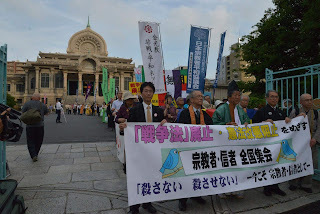 Says, "Welcome to Camp Schwab Home of the USMC & III MEF's Striking Power"
Says, "Protect What You've Earned"
Over 300 religious men & women gathered at Tsukiji Honganji temple and marched city center about one hour to call to people to take more action towards political issues. It was a quite outstanding event. Buddhist, Christian, Shinto & Muslim gathered at once. And also Political leaders from 4 different parties came to show their solidarity. Many people stopped and looking, what's going on? Never seen this numbers of monks walking. A Muslim man joined & gave a speech.